Although one of the smaller fish you are likely to encounter at 1″ to 1-1/2″, the Rams live up to their name! The Ram is prized for its winning and social personality despite its fierce appearance. A member of the Cichlidae family, Rams are one of the more social and peaceful freshwater fish. 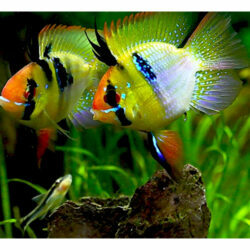 They can be expected to swim with other members of your tank non-aggressively, and are known to often pair with only one mate. 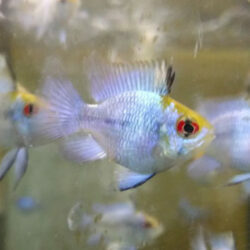 Take a look at our German Blue Bubbe Ram fish in action here!